I'm often asked how I research my crime novels and in particular the police procedure and crime scene investigation side of things. I'm not married to a police officer or a former police officer so I didn't start off with any inside knowledge. I am married to a retired fire fighter though so when it comes to fires, burnt bodies and serious traffic and other incidents which fire fighters attend, I have a wealth of information to draw on which can be incorporated into a crime novel. Indeed I have done so. THE SUFFOCATING SEA (DI Andy Horton #3) begins with a body on a burning boat and Horton almost gets fried alive in a locked vestry while investigating a crime. In BLOOD ON THE SAND (DI Andy Horton #5) there is a fire in a house where Horton is with a possible suspect (and a cat) and in DEATH SURGE (DI Andy Horton #10) and FATAL CATCH (DI Andy Horton #12) victims are found after a fire, the first in one of the tunnels in the ancient fortifications around Portsmouth Island and the second in a house by Fareham Quay. But to get back to police procedure. So where do I get the police procedural information from and how can writers obtain this kind of information? When I first created the enigmatic, flawed and rugged DI Andy Horton in TIDE OF DEATH I approached Hampshire Police (the county in which my novels are set) and asked if I could visit the police station and talk to some police officers in CID and in what was then called the Vice Squad. Hampshire Police were brilliant. They let me visit them twice even though I wasn't then published. That gave me some basic background which I have since built on and now I know many police officers and those in civilian jobs attached to the police service. I'm grateful to Hampshire Police and forensic experts for their help and patience and for being so generous in giving me their time. It's also worth following the police on Twitter. There are many official feeds from the various police units as well as from individual police officers and ex police officers. There are also feeds from those involved in forensic science and other aspects of the law with links to some highly informative blogs written by these individuals. Linked In can also connect you with professionals. A search on the Internet or Twitter can help you find police officer blogs and articles. Then there are some very handy guides available to buy from bookshops, on line or to borrow from your local library. The Crime Writer's Handbook is one, written by former UK detective Stuart Gibbon now a consultant and author with his second book Being a Detective due out in March 2019. Another well thumbed book I consult is again named The Crime Writer's Handbook by Douglas Wynn subtitled 65 ways to kill your victim in print! I have also run events called CSI Portsmouth and CSI Southampton where I bring crime authors, police and crime experts together to debate crime fiction and crime fact. Nothing is planned at present on this front but if a new event is organized it will be posted here on my website. There are also courses for writers run by serving police officers and ex-coppers, the Crime Writers' Association, of which I am a member, have a very useful website called the Crime Readers Association for crime fiction fans along with useful blogs, articles and information for budding crime writers. Of course my crime novels cannot truly reflect real police procedure because if they did they would end up reading like a police manual and bore everyone to tears. So the basics are then spiced up and tweaked by my imagination. One of the problems with writing contemporary crime novels though is that the police service in the UK is continually being re-organized by the government which means that no sooner do I mention a department than its name changes or it merges with another. It is not possible to be a hundred percent correct on this but they were correct at the time of writing. There are advantages in writing an historical crime novel, my first set in 1950 is due to be published this autumn (2019) and features a Scotland Yard detective, Inspector Alun Ryga, who is sent to the coast to investigate a complex murder in DEATH IN THE COVE. In an historical crime novel I don't have to wrestle with the fact that the names of the police departments change, also the red tape that today surrounds serving police officers was practically non existent. The challenge though is to get what procedure there was correct and to incorporate that and the way of thinking and investigating into the novel to ensure it is an entertaining and intriguing read. I hope I have done so. Hi Pauline, Im in the throes of writing a fantasy/thriller where I need some knowledge of certain basic police procedures. So far Ive only written what I know by watching TV. My son is a police officer but seems reluctant to advise me of anything I want to know. CSI Portsmouth looks to be a good idea and as I only live across the harbour in Gosport I will do my best to try and get there. I think you`ll find the CSI Portsmouth event on Saturday 5 March 2016 very helpful. You`ll also be able to make some contacts with the police there which will be useful. Hope to see you there. You say, "There are also blogs run by serving police officers and ex-coppers, some of whom run courses for writers." Do you know of any yourself - having difficulty finding courses like the one you mention. Hi, You could check out the following websites, one is the Crime Writers Association website http://thecwa.co.uk/the-debuts/ where there are articles. Talks and events are also often advertised on there. The other is run by a former detective, Stuart Gibbon who I know is very helpful and runs courses and gives talks http://gibconsultancy.co.uk/crime-writing-consultant/ I hope that helps. Pauline. I`ve been reading about police procedures in the UK, but most mention the finding of a body. If this were to be a body part, such as a hand including fingers and up to the elbow would these procedures be the same as a body, or would the police remove the body part and start procedings after that. Thank you, in advance, for your help. Hi Cheryl, They would certainly seal off the area in order to search for more body parts and for any forensic evidence. The scene of crime team would go in, even if it is skeletal remains. 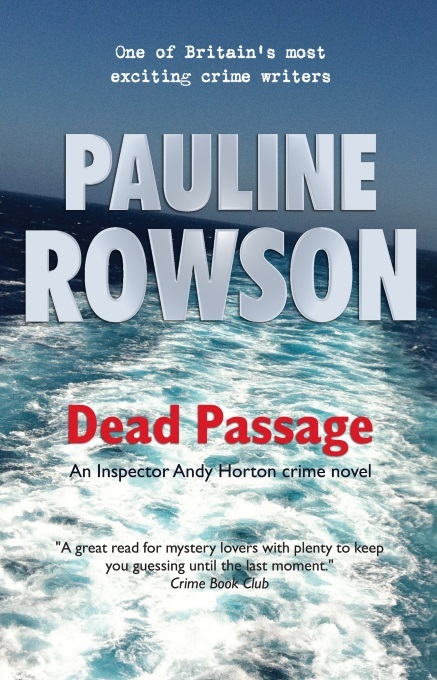 I`ve used this is the latest DI Andy Horton novel DEAD PASSAGE, where skeletal remains are found on Rat Island in Portsmouth Harbour. A forensic archaeologist is called in to examine the remains and determine how old they are, but a much more in depth analysis follows in the lab along with laboratory tests to see if more information about the individual is forthcoming. In the case of Rat Island being MOD property the army forensic team were called in to examine the area rather than the police scene of crime team.The scene of the discovery of the parts might not be where the victim was killed, they could have been transported there even so forensic evidence could still be discovered so yes the area would be sealed off. In DI Andy Horton FATAL CATCH a severed hand is found but that is in a plastic container in the sea. Obviously the sea can`t be sealed off and the container having been in the water would probably not show any evidence although the inside might. The hand would be examined by a forensic pathologist if there is still flesh on it who might also consult with forensic archaeologist and others to extract further information. Hope that helps.